wen Jones (1809-1874), the son of a Welsh antiquary, was an architect and interior designer. He studied with the architect Lewis Vulliamy (1791-1871) and then entered the Royal Academy schools. After a European tour which led him to sketch and paint the Alhambra, the Moorish palace at Granada, his attempts to get these lithographed led him to set up a printing establishment. Apart from the Plans, Elevations, Sections and Details of the Alhambra (1836), which was the first English chromo-lithographed work, Jones is best known for his Grammar of Ornament (1856) which came to be regarded as a masterpiece, but he specialised as a colour printer in the illuminated gift book beloved by the Victorians. Owen Jones started working for Thomas De La Rue in 1844, who was at that time keen to have the best artists working for him. 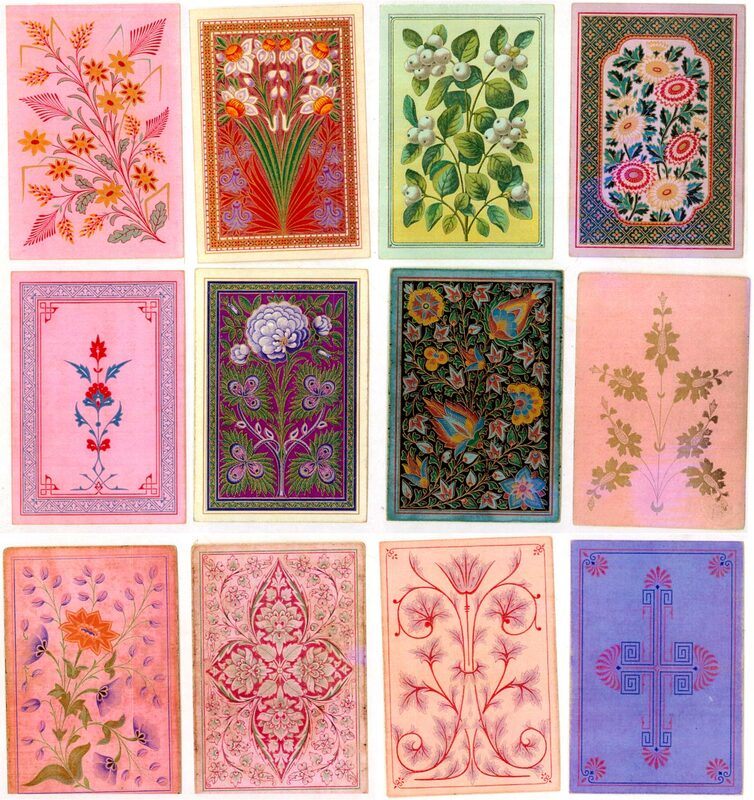 In the ensuing twenty years Jones created 173 different playing card designs varying from fruit-and-flower themes to Chinese and Arabesque. Owen Jones played a prominent part in the lives of three generations of De La Rues - Thomas, assisting Warren and William Frederick, and finally Warren's son, the eccentric Warren William, who was sent to him to learn lithography. 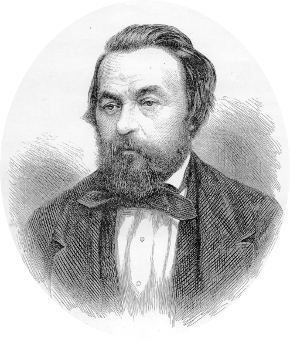 Owen Jones was appointed superintendent of works for the 1851 Crystal Palace Exhibition and took an active part in decorating and arranging the building. Louis Cohen, who founded New York playing card maker Lawrence & Cohen, also shared the services of Owen Jones, whose name appeared on their ace of spades in c.1865. Above: eight playing card back designs by Owen Jones. Jones advocated a strong design philosophy with an underlying sense of the unity between art and culture. He realised that many of the great masterpieces from antiquity, including Moorish art, were based on geometrical grid patterns embellished with graceful and refined arabesques. Above: three backs from the Royal Illuminated Playing Cards, c.1850. Charles Dickens was delighted with the 'poetry of card-making', the 'graceful designs' and 'dainty little pictures' by Owen Jones which appeared on the firm's playing cards for members of the Royal family. Jones-designed cards were expensive. De La Rue advertised the 'Royal Illuminated Playing Cards' in an 1851 Illustrated London News at 'Two Guineas the Set of four patterns or singly 10s 6d the pack'. This was, of course, extremely expensive. 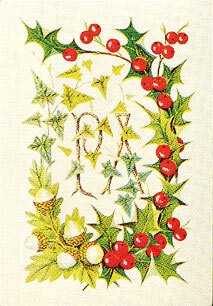 The Queen's design depicts roses and hawthorn. Prince Albert's consist of prickly holly, ivy and oak. The Prince of Wales' design depicts daisies and fuchsias. Owen Jones was a member of the circle of people around Henry Cole who was aiming at higher standards in the Art Manufactures and whose ideas later influenced William Morris. In later life he decorated private houses including the Palace of the Viceroy of Egypt. He exhibited architectural designs at the Royal Academy between 1831 and 1861, and he also designed wallpaper, textiles and carpets. He died in 1874 aged 65 at his home in Argyll Place, Regent Street, London. For further reading see: Michael Cooper & Ken Lodge, "Owen Jones (1809-1874): Architect, Decorative Artist & Designer of Playing Cards" in 'The Playing Card', Journal of The International Playing Card Society, Vol.34, No.3, Jan-March 2006, pp.181-192. Also: The Newsletter of The English Playing Card Society, No.10, November 1985, pp.8-9.